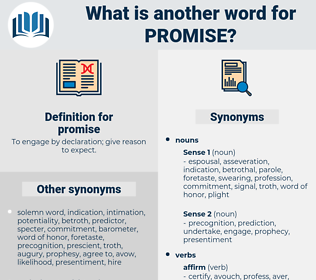 What is another word for promise? To engage by declaration; give reason to expect. the best/worst is yet to come. assure, commitment, guarantee, reassure, jeopardise, deliver. incapacity, incompetence, inability, impotence, lack, ineptness, weakness. denial, breach, disagreement, hopelessness, divorce, impossibility, renege, break. disagree, reject, disapprove, unfasten, give up, release, loose, disavow, let go, refuse, lose, deny, enlarge, break off, dissent, loosen, protest, untie, discourage. Only you will promise me, that as I cannot be your wife there shall be no other. Promise me, Red, that you won't go until you've heard me out. parole, pinning, troth, engagement, rain check, word of honor, word, betrothal, oath. guarantee, pledge, undertake, contract, swear off, plight.